This weekend, I decided to make a nice dinner. I saw Mastering the Art of French Cooking sitting on my bookshelf and realized that I don’t utilize this book often enough. I decided see if any of the dishes jumped out at me, and that’s when I found the recipe for Beef Braised in Red Wine, with accompaniments of Brown Braised Onions and Carrots Braised in Butter. Now that sounded like one amazing dinner! I’m not going to lie. It took some advanced planning and some creativity on my part, as there is no bowl in my kitchen large enough to hold a 4.5 pound roast, a bottle of wine, 3 cups of chopped vegetables, brandy, and olive oil. As luck would have it, I happened to have a rather empty refrigerator, so I had plenty of room for my 7.25 quart dutch oven, the only vessel large enough to hold all of the ingredients, the vessel that would ultimately end up cooking the roast, as well. 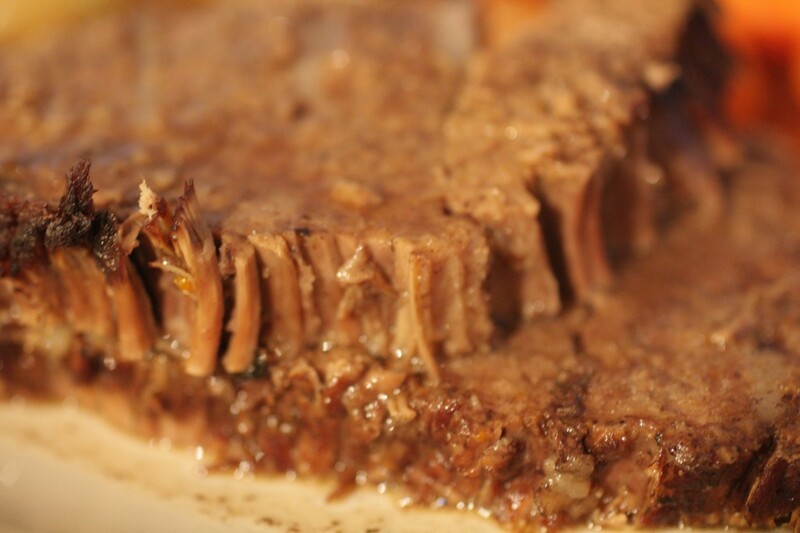 It also took me an hour to do all of the prep work the night before, because I followed Julia’s instructions to “lard the meat.” Yes, a chunk of beef marinating overnight, and braising the next day was not enough to ensure a tasty main course. Julia also suggests that you, or your butcher, shove chunks of pig fat throughout the roast to “baste the interior of the meat as it cooks, and make an attractive design when the meat is sliced.” The thought of pig fat marbled throughout my roast didn’t sound very appealing to me – I am the type who cuts away every little portion of fat that she can find in a piece of meat – but the thought of a nice, juicy roast was rather tempting. So I bowed to the master herself, and spent 30 minutes cutting strips of pig fat, cutting slits throughout my roast, and stuffing those slits with the fat. I also needed to track down veal knuckles, split calf’s feet, and some pork/bacon/ham rind. Ah…okay. The rind was easy – I had some pork rind leftover from the pig fat (well, the fat was attached to rind and a little meat, but it was mostly fat), and my mom had recently given me some leftover ham that happened to have rind attached. Perfect. But what to do about the knuckles and the feet? Well, I took the easy way out. Whether correctly or not, I figured the reason they were in the recipe was for the bone, so I simply picked up a beef soup bone for the bargain price of a dollar. 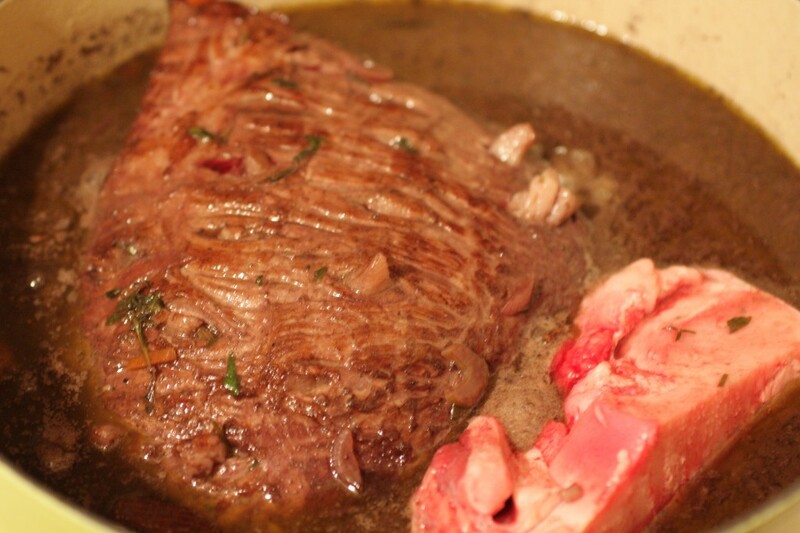 The bone should lend flavor, as well as help gelatinize the braising mixture. After the roast marinated overnight and throughout the morning, with several turns of the meat to make sure all of it was exposed to the goodness of the marinade, it was time to drain the roast and dry the surface so I could brown it. If I thought the smell of the marinade was great, it was nothing compared to the scent of the roast as it was browning. With all of my windows open, I half expected neighbors to start showing up; they are a little curious, after all. But they left me to cook in peace. Once the roast was browned all around, it was time to add back the marinade and reduce. Again, the perfume emanating from that pan was simply divine. I could smell the scent of the wine and brandy mixed, the herbs, the bay leaves, and the vegetables. I wondered how such a simple dish – a rump roast – could have me looking forward to dinner in a way that I haven’t done in quite some time. The really nice thing about this roast is that once it’s in the oven, there’s very little that needs to be done. Sure, I would take it out every 30-45 minutes to turn it over in the braising liquid, but I had plenty of time to clean up the little mess I made, time to sit and read for awhile, and then time to get the vegetables ready. For the first time, probably ever during the cooking process, I managed to have a kitchen that lacked a single dish in the sink. That would all soon change. The real fun came in the last hour of cooking the roast, as I started on the onions, and then the carrots. The dishes were starting to pile up as I ran out of room in the dishwasher, and as soon as the roast came out of the oven, the real Sara was back in the kitchen: pots, pans, and dishes were scattered everywhere! I removed the roast to a glass baking dish to sit under foil while I worked on the sauce. I had to strain the braising liquid through a sieve (to catch all of the vegetables, herbs, and chunks of ham and bacon rind floating around) and reduce the sauce. My dutch oven, now a filthy mess, was relegated to the sink. The vegetables from the sieve had to be dumped into a “garbage bowl” to cool before I could dispose of them. I had carrots on top of the stove, the onions were moved to a small saucepan with a pat of butter (per Julia, I wasn’t the one to come up with the idea to toss them in even more butter), and the saute pan that I cooked the onions in was added to the growing pile in the sink. There was no available space in my kitchen. In other words, everything was perfectly normal. And yes, it was all worth it. Place half the vegetables, herbs, and cloves in the bottom of a very large bowl (I had to use my dutch oven). Rub the meat with salt and pepper and place over the vegetables. Sprinkle the remaining herbs and vegetables over the meat. Pour the wine, brandy, and oil over the meat. 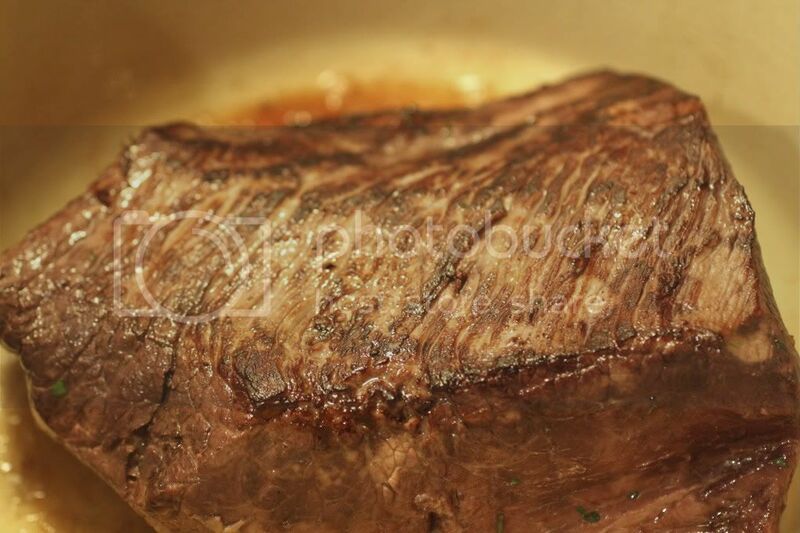 Cover and marinate for 6 hours at room temperature or 12-24 hours in the fridge. Turn and baste the meat every hour. Half an hour before cooking, drain the meat on a rack. 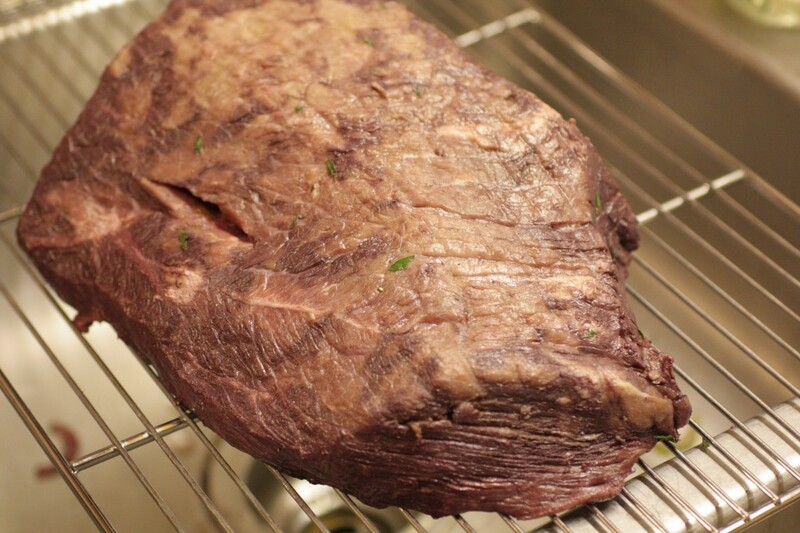 Just before browning, dry it thoroughly with paper towels; it will not brown if it is damp. Add canola oil/pig fat to the Dutch oven and heat over medium-high heat until smoking; brown meat on all sides. This takes about 15 minutes; pour out the fat. Pour in the wine marinade; boil it down rapidly until it is reduced by half. Add the beef soup bone and rinds, and pour in enough bouillon or stock to come two thirds of the way up the beef. Bring to a simmer, skim, cover tightly and set in the lower third of the preheated oven. Regulate heat so liquid remains at a gentle simmer for 2.5 to 3 hours, and turn the meat several times during its braising. 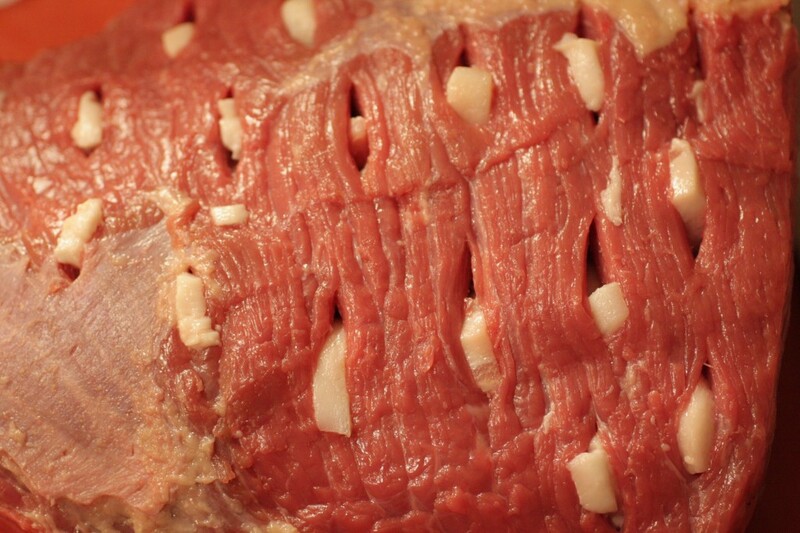 The beef is done when a sharp fork will easily pierce it. 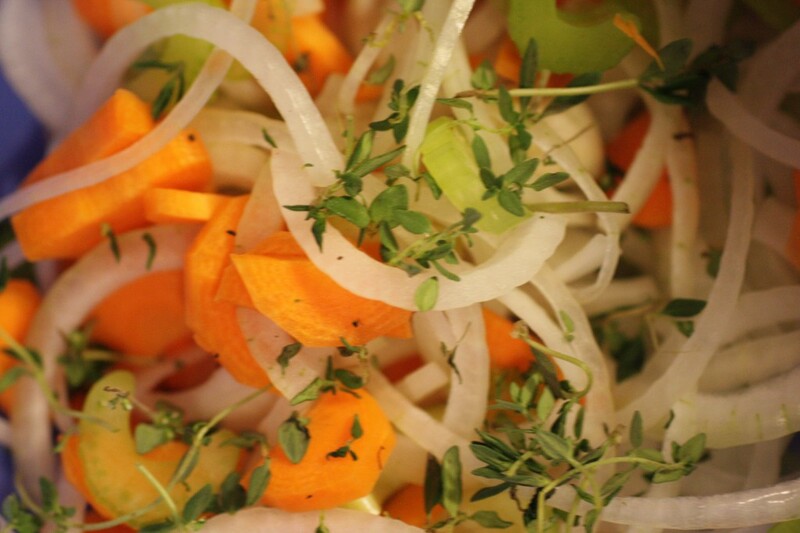 While the beef is being braised, prepare the carrots and onions, set aside until needed. When the meat is tender, remove it to a platter. Trim off any loose fat and cover with foil to keep it warm while finishing the sauce. Skim the fat off the braising juices, and strain them through a sieve into a saucepan, pressing the liquid through the vegetables. Simmer for a minute or two, skimming, then boil rapidly until reduced to about 3.5 cups of liquid. Taste for seasoning, correct if necessary. The sauce should be lightly thickened. If it’s too thin, beat in the starch and wine mixture and simmer for 3 minutes. Carve the meat and arrange on a platter with the vegetables and a few sprigs of parsley, spoon some sauce over the meat. Sounds amazing! I would have never thought to put the pig fat in the roast. I love braising, especially when it’s cold out. Sara, I hear you on braising when it’s cool. 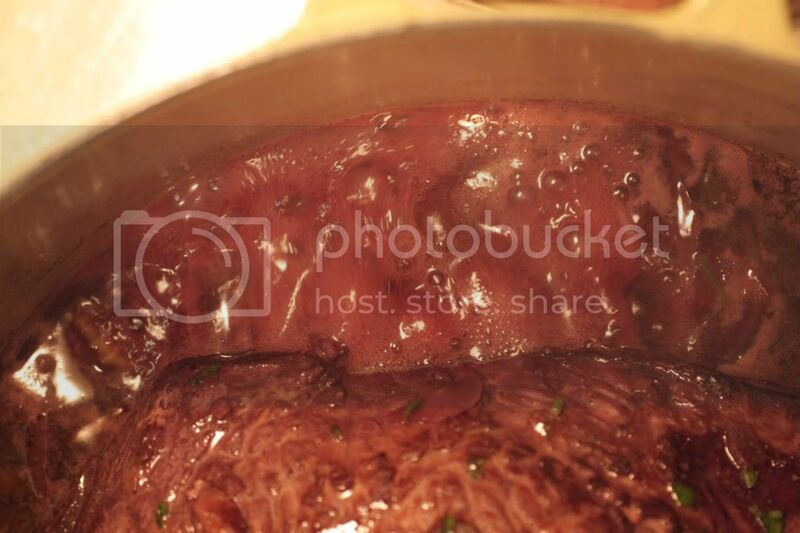 It’s been unseasonably cool throughout May/early June (so far), so I may soon be braising again! I just discovered your site and am thrilled. I will be making this recipe in the next several days! Your photos are divine! I made this recipe and it is truly a labor of love! I started mine on a Sunday afternoon and finished it Monday night at 10:30 p.m. One thing about following recipes from “Mastering the Art of French Cooking” is that you should do it on a weekend! Nancy, I realized after preparing this meal that if I tried to cook like that every day, all I would ever be doing was making dinner!